The bhut jolokia also known as bih jolokia, u-morok, ghost pepper, red naga, Naga Jolokia, and ghost chili, is an interspecific hybrid chili pepper cultivated in the Indian states of Arunachal Pradesh, Assam, Nagaland and Manipur.It is a hybrid of C. chinense and C. frutescens genes. Helps relieve Arthritis by reducing joint inflammation and to reduce pain. Cold and Flu prevention and healing by sweating more and reducing sinusitis and other flu symptoms. The Ghost Pepper has a Scoville rating of 1,000,000. The average jalapenos have a 2,500 to 6,000 rating. Bell peppers have a 0 rating, and the Habaneros have a 300,000 SHU rating. The hotter you get the more effect that the ghost pepper has on your body. The Ghost Pepper has been known in India for hundreds of years. The consumers of the ghost pepper are known to have great health, but this pepper has only been discovered by the western world recently. The key ingredient in hot peppers is Capsaicin. It is usually found in curry, and has been used in curing many dis-eases while also helping with good health. The ingredient in the ghost pepper was tested in cancer research and it was found to kill and inhibit further growth of cancerous cells. 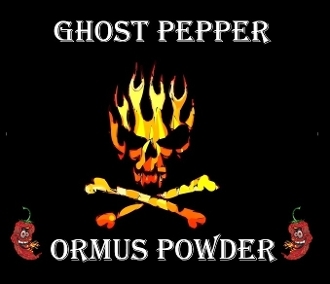 In order to make this Ormus I added whole ghost peppers to warm harmonically structured water and blended it all up. 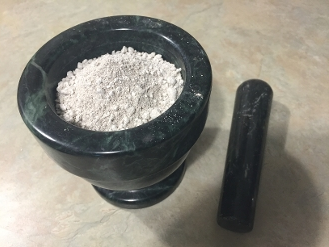 I then added Organic Dolomite Lime and preformed the John Hudson Method. After washing it 7 times it turned into the hottest known Ormus powder.